Searching for a photo of the King shaking hands with Richard Nixon? Or perhaps a snapshot of Nixon playing the dulcimer is more to your liking? Then look no further than George Mason University. 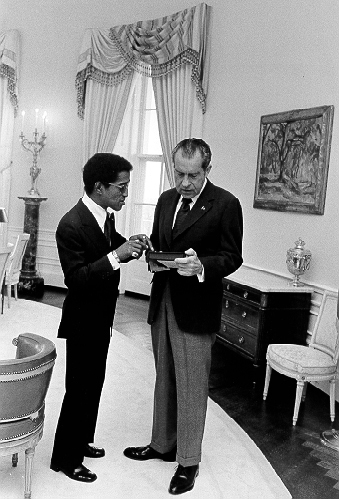 Likely unknown to most of Mason’s political junkies is that Fenwick Library has a treasure trove of original photographs of the 37th president doing everything from greeting Sammy Davis Jr. to chatting with Johnny Cash in the Oval Office. 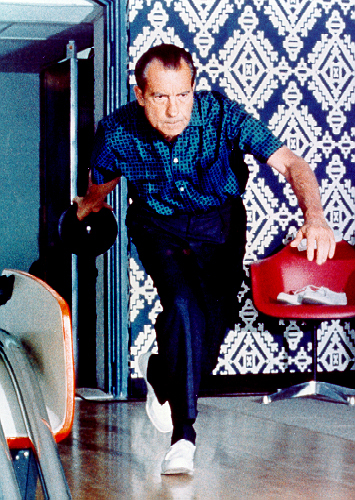 There’s even one of Nixon bowling. The photos were captured by late chief White House photographer Oliver Atkins. Atkins began his career in D.C. with the Washington Daily News in 1940s, before photographing the front lines of World War II for the American Red Cross. After the war, he joined the staff of the Saturday Evening Post, where he photographed such 20th-century luminaries as Harry Truman, Dwight Eisenhower, and John F. Kennedy. Atkins began his work at the White House in 1969. 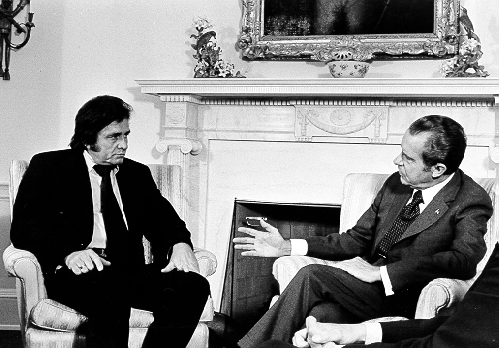 While there, according to library officials, the most famous photo he took was likely that of Nixon meeting Elvis Presley in December 1970. Part of the Mason’s collection, the photo is the library’s most requested Atkins photograph. Atkins’ family donated his vast body of work, to also include thousands of photos taken for the Saturday Evening Post, to Mason in the ‘70s and ‘80s. Once an owner of part of the land Mason’s Fairfax Campus now sits on, Atkins occasionally took photos of the campus. “He was friend of the university,” says Jordan Patty, interim head of Mason Libraries’ Special Collections and Archives Department. In June, the department was awarded a $25,000 grant to help catalog and preserve the collection as well as promote it. The money is also being used to do the same with a collection by Arthur Scott, who started photographing Capitol Hill in the 1930s for The Washington Times. Regarding Atkins’ collection, which is partially digitized online, Patty says most of the people who ask to see it are historians, writers, and people who work for various publications. On its condition, he says the only problem they are encountering is with the delicate acetate negatives. The photos, themselves, he assures, are in remarkably pristine condition. Specials Collections and Archives is in room C-204 on the second floor of Fenwick Library. Worth a Look is an occasional series on some of the things that make a visit by alumni to one of Mason’s campuses well worth the commute to get there.